An oil and gas well produces on public lands in Utah. Photo by Ellen M. Gilmer. Supporters of an Obama-era hydraulic fracturing rule are mobilizing to oppose the Trump administration's newly announced effort to scrap the regulation. Hours after government officials notified a federal court yesterday that they are working to rescind the fracking rule, a filing by environmental groups urged a panel of judges to allow litigation to move forward as scheduled. Earthjustice attorney Mike Freeman, who is representing the groups, said the Interior Department's new plan to roll back the rule is purely partisan. "This is a political decision intended to circumvent the rule of law and deliver a gift to the oil and gas industry at the expense of public safety," he told E&E News. "What the Trump administration wants is to go back to using outdated 30-year-old regulations that BLM itself recognizes failed to address threats to public health from modern fracking." Justice Department lawyers representing Interior have asked the 10th U.S. 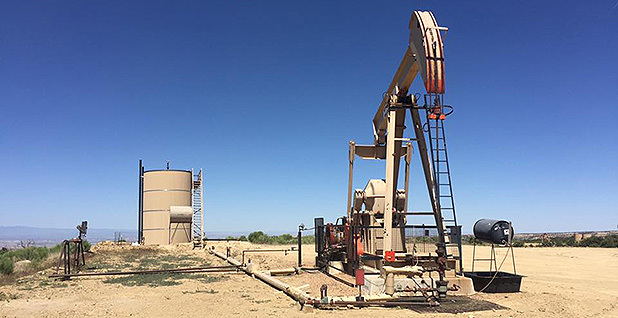 Circuit Court of Appeals to delay oral arguments scheduled for Wednesday in the government's ongoing appeal over the fracking rule and put the case on hold while the administration works to rescind the regulation. A decision by the government to back away from the case would have major consequences, as the district court ruling at issue in the appeal found that Interior does not have authority to regulate fracking at all. The embattled rule sets new requirements for well construction, wastewater management and chemical disclosure for fracked wells on public and tribal lands. It was the Obama administration's marquee effort to address impacts from the rapid expansion of the use of fracking and horizontal drilling for oil and gas development. The rule has been tangled in litigation from industry, states and tribes since its March 2015 release and has never taken effect. In yesterday's court filing, Interior said it began reviewing the rule in response to President Trump's January executive order on streamlining the regulatory process. "As part of that process, the Department is reviewing the 2015 Rule (and all guidance issued to implement that rule) for consistency with the policies and priorities of the new Administration," Richard Cardinale, chief of staff to Interior's assistant secretary for land and minerals management, said in a filing. "The initial review has revealed that the 2015 Rule does not reflect those policies and priorities." Interior will kick off a rulemaking process within 90 days to rescind the regulation. Agency officials did not respond to requests for more information on that process. Supporters of the fracking rule expressed outrage yesterday at Interior's plan. Former Deputy Secretary David Hayes, who served at Interior during the Clinton and Obama administrations and helped craft the rule, said rolling back the regulation undermines the federal government's ability to oversee public lands. "Some elements of the oil and gas industry obviously asked the Interior Department to step away from fracking regulation, and this administration has shown a disturbing propensity to do what some in the oil and gas industry want them to do," he said in an interview. "The reason it's particularly disturbing is that a fundamental responsibility of the federal government as a steward of the public lands is at issue here." Hayes noted that the creation of the fracking rule was a "tremendous undertaking" and that the rule "got better and better" throughout the long rulemaking process. "To have all that work wiped away is certainly disappointing, but it's not the amount of work that's the issue," he said. "It's the principle here." Hayes joined former agency officials from both Republican and Democratic administrations in an amicus brief last year that urged the 10th Circuit to reinstate the fracking rule after a district court in Wyoming struck it down (Energywire, Aug. 22, 2016). Earthworks policy director Lauren Pagel said the Trump administration's plan "prioritizes billionaires and big business over the public interest," and Center for Biological Diversity attorney Michael Saul added that the decision is a red flag for the priorities of newly installed Interior Secretary Ryan Zinke. "It undermines the suggestion that Secretary Zinke might have been a kinder, gentler sort of Trump appointee," he said. "Really, he's backing away from a long overdue and very modest effort to deal with some of the admittedly huge challenges with the growth of hydraulic fracturing on BLM lands." Oil and gas industry advocates, meanwhile, cheered Interior's move to scrap the rule as an acknowledgement of its costly requirements. "Obviously we had the lower court ruling, which was very clear that BLM did not have authority for this rule, and rather than continue to fight in court over that, I think the Trump administration wisely decided that this rule just needed to be rescinded," Western Energy Alliance President Kathleen Sgamma said. "States are effectively regulating fracking, and BLM does not need to duplicate." BakerHostetler attorney Mark Barron, who is representing the Western Energy Alliance and the Independent Petroleum Association of America in the case, agreed, noting that he's "pleased that they're reconsidering a rule that was not well-considered in the first place." Colorado Attorney General Cynthia Coffman (R), one of the rule's first challengers, also praised the news. "The current administration understandably does not support the Bureau of Land Management hydraulic fracturing rule that we sued to enjoin in 2015, and we expect the upcoming 10th Circuit argument will be canceled," she said in a statement, adding that the rule "intrudes on Colorado's sovereignty" over development within its borders. The 10th Circuit is expected to quickly decide on the Trump administration's request to delay next week's scheduled oral arguments. What happens after that is uncertain, but the court recently indicated it would be open to supplemental briefing if the government's legal position has changed (Energywire, March 10). Freeman said the environmental intervenors in the case will continue pushing the court to hear the appeal regardless of Interior's plans to rescind the rule because the case deals with much broader questions of federal authority. "Any decision by BLM to rescind the Rule will necessarily be informed by whether it has legal authority to manage oil and gas development on public lands," the groups told the court last night. "The agency's reversal of position does not eliminate the need for appellate review here." The U.S. District Court for the District of Wyoming's decision to strike down the fracking rule last summer was sweeping, finding that Interior lacks authority to regulate fracking. The court rejected Interior's arguments that it has a duty to address environmental concerns for activity taking place on government-held lands. "I would argue that [the ruling] was an extreme outlier of a decision, and I think it was very vulnerable in the court of appeals," Saul said. "Definitely a grave concern I have is that they're going to attempt to back out of this case in a way that leaves that ruling in place and undermines future efforts to deal with the huge challenges posed by the expansion of hydraulic fracturing on BLM lands." Continuing a legal defense of a rule the federal government no longer supports would put Earthjustice in an awkward but not unprecedented legal position. In 2001, for example, environmental lawyers defended the Clinton-era Forest Service "roadless rule" after the George W. Bush administration announced plans to reconsider it.